If you do any type of regular hammer and nailing, it could be time to look into a nail gun. Most people think of these tools as simply a way of adding convenience and, although that’s true, the benefits are further reaching. Nail guns are safer, faster, and more accurate than the old hammer and the nail. What am I nailing through? As you might expect, not all nail guns are alike. Using nails that are too big with a gun that is too powerful will blow right through a thinner piece of wood. Using smaller fasteners and a gun with less PSI is going to compromise your attachment. Of course, even if you know your project and what type of material you’re nailing together it’s going to be hard to go out and buy the right nail gun. This is because there are so many other factors that go into making that purchase. For example what kind of power source are you using? Do you have access to compressed air or are you going to buy canisters of gas for each project? Will an electric nailer give you enough power for your project? No matter the type of nail gun, there is different construction and features to each one. For example, nails can be loaded either in coil form or in a strip for most types of guns. The deciding factor in choosing a particular gun over another could be additional features, most notably safety. Trigger method and ricochet shields, for example, are features that contribute to gun safety. Performance can also be affected when guns have depth and nail adjustments. The different types of nail guns are sorted by the common type of project in which they are used. Is the work heavy duty or light duty? Some nail guns are diverse where they can handle a variety of different projects while others are a specialty, such as flooring nailers. Brad nailers are used for light duty work that involves intricate detail and thin pieces of wood. The fasteners used in a brad nailer are very thin and light which is why a brad nailer might actually be one of the first types of nail guns that you purchase. With framing nailers, for example, you could always pound the fasteners in by hand if needed. That’s simply not possible with 18 to 23 gauge brad nails that are almost guaranteed to bend over when driven in by hand. Brad nailers are used a lot for cosmetic purposes as opposed to ‘holding something together.’ Attaching trim, for example, is a common project for a brad nailer. The trim pieces are light and simply need to be fixed to the wall but glue is not strong enough and is too permanent. That’s actually a good way to consider brad nails – a step up from staples although they do provide better fastening performance as the nails can be up to 2” in length. The Hitachi NT50AE2 is ideal for small carpentry projects because it uses 18 gauge nails that are up to 2” long. The aluminum gun is lightweight at just 2.2 pounds and it is well balanced for comfortable long-term use. This Hitachi product is loaded with special features which include depth-of-drive adjustments, a 360-degree adjustable exhaust vent, and a removable tip to expand product life. This nail gun is also devoted to safety as users can switch from bump fire to contact fire with the flip of a switch. Jammed nails can be extracted without the use of a tool and an elastomer grip prevents hand slippage. This is a pneumatic air gun that requires 70-120 psi to operate. Included in the kit are the nailer, safety glasses, a nose cap, and protective case. Framing nailers are the tool of choice for carpenters that are actually doing the ‘building’ of something. The most common framers on the market are set up for either 8d (penny) or 16d nails which accommodate a majority of construction needs. Framing nailers offer unprecedented holding power and they can be used with any type of wood. Framing nailers are used when fasting lumber, posts, beams, fences, deck supports, and some instances where a hammer would cause damage. Framing nailers are going to be one of the heaviest guns on the market. The use nails that are up to 3-1/2” long but there are also specialty framing guns such as those used to install wood siding. 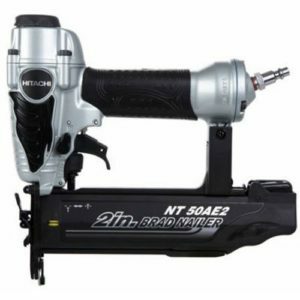 One feature you’ll want to investigate when shopping for a new framing nailer is whether it is a clipped head or round head gun. A clipped nailer has just a little bit of the head removed so that they can collate better – holding about 30% more nails compared to the round head. You’ll have to check with local building codes however as some have gotten rid of clipped head use. Paslode fuel powered framing nailers are arguably the most popular on the market. This particular model runs on a rechargeable 7.4 volt lithium ion battery. That battery can fasten up to 6,000 nails per charge which is said to be about 50% above the industry average. The battery can be charged fully in about an hour but also features fast charge capabilities in which 2 minutes on the charger can shoot up to 200 nails. The Paslode 902600 has an embedded hook for easy attachment to a tool belt and is relatively lightweight at 7.5 pounds. The sales package includes the nailer, a rechargeable battery, a carrying case, safety glasses, a battery charger, and a 5/32 hex wrench used for internal access. You will also need a fuel cell to use this nailer. 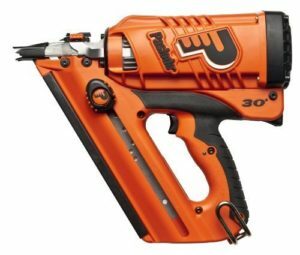 Finish nailers are going to seem very similar to Brad nailers and it’s true that both guns use thin gauge fasteners to complete the job. The guns look the same and are a similar size/weight but brad nailers are just a little bit smaller. Not only that, brad nailers don’t use nails – the technical term for their fasteners are ‘brads’ – hence the name. Most contractors feel that a finish nailer is much more versatile than a brad nailer. That being said the wider variety of jobs that a finish nailer can handle does not include those that need a clean cosmetic finish or that require thinner wood pieces. Finish nails have a larger head dimension which does give them increased holding power. Unfortunately, if you don’t want to see the hole from penetration, you need to fill it in with wood putty. 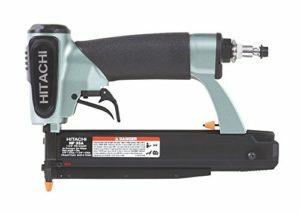 The Hitachi NT65MA4 is an affordable and versatile finish nailer that fires 1-1/4” to 2-1/2” nails that are 15 gauge in thickness. This model has a built-in air duster which can be especially beneficial to finishing jobs. Users can clear away debris from the work surface so that the material can be nailed and glued. 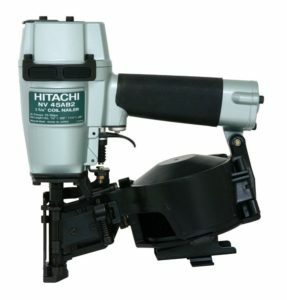 The reason that this Hitachi product is considered top-of-the-line in the finish nailer market is mainly its efficiency. For example, nail jams can be cleared via a retractable nose and do not require the use of special tools. Users can also switch from sequential to contact actuation with the flip of a button which can be beneficial depending on the job. Depth of drive can be adjusted by turning a knob and the exhaust turns to 360 degrees to funnel fumes and hot air safely away. On top of that, the unit is only 4.2 pounds and the fitting is angled so that even the compression hose does not get in the way of this pneumatic tool. Pin nailers fall between a brad nailer and stapler. They are becoming increasingly rare in the construction and finishing industry but you’ll still see some on the market today. The biggest advantage of a pin nail is that it has more holding power than a staple, but leaves a less evident hole than a brad nail. Pin nails don’t have a head at all and all guns shoot a 23 gauge fastener that is up to 2” long. Pin nailers are definitely finesse tools but they are also pneumatic which means they do have the ability to secure through some thicker hardwoods. Pin nails are especially useful in delicate jobs where glue gets messy. Pin nailers are also worth a purchase if you work mainly with white crown molding. The small pinhole is very hard to see on the white wood and doesn’t require as much putty – which can be evident against the glare of a light. While there are a select few projects where a pin nailer accomplishes the job, the Hitachi NP35A offers a versatility that leads to success when that time does come. This product has a large fastener capacity and offers the convenience of being able to automatically adjust between 5/8” up to 1-3/8” fastener lengths on the fly. Pin nails are sharp yet surprisingly sturdy which is why the NP35A model features a dual trigger for safety as well as accuracy. Performance is also boosted by simple depth adjustments and a housing shield to protect the work surface. This feature is especially important considering how pin nailers are used largely for their cosmetic advantages. A few features installed for added convenience include a reload indicator to notify you of when fasteners are running low and a rear exhaust that keeps oil drippings and debris away from the work area. This pneumatic pin nailer is very lightweight at just 2 pounds and comes with safety glasses, a protective case, and lubricating oil. You can probably guess the main use for flooring nailers. To secure hardwood flooring planks to the substrate the best option really is a flooring nailer. The fasteners apply deep into the hardwood at an angle as to not disrupt the tongue and groove needed to create a tight seam from plank to plank. There is another accessory almost always included with a flooring nailer and that is a rubber mallet. The flooring nailer is lined up to the tongue and groove of the plank and driven in by striking the nailer with the mallet. Because of this technique of driving the nail into the substrate, flooring nailers can be used manually. Of course, the pneumatic versions of these guns are much more efficient. One more thing to remember is that there are also flooring staplers that work in very much the same manner. The flooring staplers actually provide a much firmer initial grip but loosen a bit with expansion and contraction. What kind of nailer/stapler you need depends on your climate and the thickness of the hardwood planks. This Bostitch flooring nailer is marketed as a 2-in-1 product because it can drive both 15.5 gauge staples as well as 16 gauge cleat nails. The length of fasteners that fit in the nailer range from 1-1/2” to 2” and can be used on both hardwood as well as engineered flooring installation jobs. 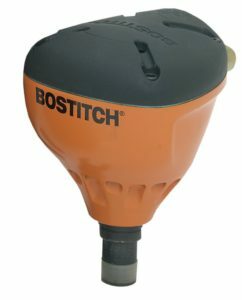 The air requirements for using the Bostitch BTFP12569 are actually very low at just 3.7 SCFM and the product comes ready to use out of the box with the tool, mallet, oil, and wrenches for swapping baseplates all included. Speaking of baseplates, they are non-marring and interchangeable for 1/2” through 3/4” planks. The pneumatic flooring nailer operates with mallet driving action, but it is also designed for maximum comfort while doing so. The ergonomic design features a longer handle than industry competitors as well as a rubber grip for safety and performance. The product is also relatively lightweight as far as flooring nailers go, weighing in at 10.85 pounds. Another specialty type of pneumatic fastener is the roofing nailer. These guns are used specifically for installing roofing shingles that are made of either fiberglass or asphalt. Most contractors that do not offer roofing services usually do not have a roofing nailer in their tool arsenal. Best roofing nailers use coil nails that are automatically fed at a very fast rate. The tips of these guns very frequently gets gummed up when roofing asphalt on hot days. Roofing jobs are very fast and very repetitive. Therefore what you should look for in an optimum nailer is a mixture of balance and being lightweight. The grip is also important as temperatures on a roof can get pretty hot and sweaty. Many roofing nailers also have padding on the sides and possibly the handle. These rubber pads not only provide an additional handle for the user, but they also grip onto the shingles so the gun doesn’t tumble off the roof. 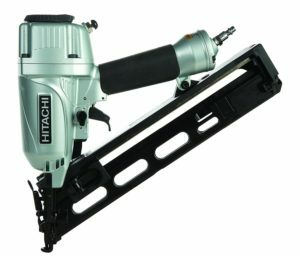 The Hitachi NV45AB2 is one of the most popular roofing nailers used by professional contractors. 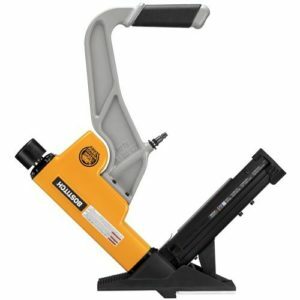 This is a coil roofing nailer with side load, capable of handling 7/8” to 1-3/4” fasteners. The product weighs in at 5.5 pounds but is also balanced for easy maneuverability. Nail depth can be adjusted on the fly with a tool-less knob and the side clip magazine makes for fast reloading. Operating pressure ranges from 70-120 psi and the pneumatic air feed mechanism helps to remove dirt and moisture from the gun chamber. This allows the Hitachi to achieve maximum performance even in the harshest roofing conditions and it’s why it’s the roofing nailer the pros prefer. Most vinyl and aluminum siding is still hand nailed by a majority of contractors but siding nailers come in very handy when attaching wood pieces like cedar. Each wood siding piece must be measured for the proper reveal, unlike vinyl and aluminum that lock into place with a lip. A pneumatic siding nailer makes this measuring job much easier as measuring and hand nailing wood siding is nearly impossible. There are some variances when it comes to siding nailers. First off other guns such as framing nailers could be used to attach the wooden pieces. Some contractors even use roofing nailers as they are very similar tools. An actual siding nailer is recommended though for the best results in both performance and cosmetics – especially if you’re siding a lot of houses. Then there are nailers equipped for aluminum fasteners and aluminum siding as well. The most frequently used type of gun, however, is the siding nailer for wood (cedar) or fiber cement. 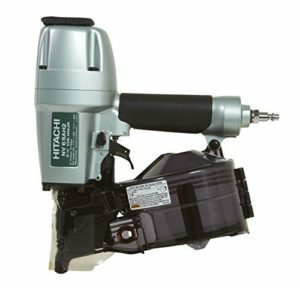 The Hitachi siding nailer has many of the qualities of the top roofing nailer from the same manufacturer. The NV65AH2 model does fire 1-1/2” to 2-1/2” fasteners and it features the convenience of a selective actuation switch which allows the user to go from sequential to contact nailing in a split second. The side load magazine makes for fast reloads – of which both wire and plastic sheet fasteners can be used. For maneuverability, the Hitachi is designed to be especially compact and weighs in at just 4.8 pounds. Depth of drive is adjusted with the turn of a dial and the product also features a no-mar nose cap to preserve the integrity of the siding. Operating pressure is between 70 and 120 psi for this pneumatic siding nailer. Palm nailers are used when the space to be nailed in is tight and there’s not enough room for a nailer to fit or a hammer to build up the driving force needed to pound the nail. Palm nailers obviously fit in the palm of your hand but there are both heavy and light duty models of this tool. The traditional palm nailer drives fasteners up to 3.5” and 16d in diameter. Bulked up palm nailers can secure fasteners up to 6” long. Palm nailers use conventional nails which is another huge advantage of the tool. Fasteners are placed individually on a magnetic holding strip and driven in by using force from the palm. The palm nailers have some advantages over hand nailing beyond convenience as well. First off, you’ll avoid injury from the hammer slipping and hitting your thumb or index finger. Also, you limit the chances of damage to the surrounding wood either from slipping or driving the nail too deep. Palm nailers might be the go-to option if you have something especially cosmetic that you need to drive a fastener into. This Bostitch palm nailer is built for performance with a magnetic nose and a small, ergonomic design. The product is ideal for driving bulk nails and is especially effective at nailing off metal connectors and joist hangers. The palm nailer weighs less than 3 pounds and is manufactured for durability with a 7-year warranty. Switchable noses create versatility depending on the job. Those noses include the standard, finish job, and large bore and also included in the product package is a leather glove for easy handling, a hex wrench, protective case, and lubricant. A long, long, time ago electric nailers were actually devices that you plugged into a wall outlet. These guns were mainly used in small shops and for crafts instead of in the construction industry but they did the job they needed to do. Today not only does an electric nailer mean battery operated, the batteries themselves are evolving at an incredible pace. Lithium battery powered nailers are the go-to choice for those who want an electric gun. 18 or 20-volt lithium batteries have the driving force of a pneumatic gun but without a cord. The lithium batteries are on the expensive side, but they also charge faster and last longer than nickel batteries. Something to consider if you’re buying a battery nailer is brand loyalty. If all of your other battery powered tools are of a certain brand, you’ll probably want a nailer from the same manufacturer so you can mix and match the batteries. Convenient in that they are cordless but also require a charged battery to operate. Will lose power as the battery drains. Quieter than pneumatic nailers and less costly to operate long term than gas guns that CO2 cartridges constantly need replacing. Easier to set up and put away as no air compressor is needed, unlike pneumatic tools. Similar power – but not quite as much and for the duration of pneumatic. The battery weighs more than gas canisters. Pneumatic nailers are arguably the most popular among construction contractors. Yes, they require the setup of a compressor, but they provide an efficiency that is unmatched when it comes to charging batteries or changing out gas canisters. Unless there is a kink in the air compressor cord, the performance is the same for every fastener put in by a pneumatic gun. The same can’t be said when a battery starts to get low on charge or the gas canister is running on fumes. There may be a number of other battery operated tools in use on a job site including drills, saws, a radio, etc. so pneumatic nailers can be beneficial as to not use up battery for those pieces of equipment. The air compressor cord can be a nuisance – but it can also come as an advantage as a way to secure the tool in uncomfortable spaces (wrapping it around a vent on a roof, for example). Less expensive than battery or gas guns, but also require the purchase of an air compressor and hose. Increased set up the time to drag the compressor out to start, drain the tank after, etc. Generally, have a longer lifespan because of less movable parts than battery or gas guns. Fuel powered guns are convenient for smaller trim jobs and do offer mobility because they are lighter. Unfortunately, gas nail guns need both a fuel cartridge as well as a battery to operate. The battery is much lighter than battery powered nail guns, but if either one of the two run out of juice the tool cannot operate.You might climb down from 30 feet in the air to change batteries only to get back up to the work post and find out that the fuel cell dies 2 minutes later. Another potential downfall of gas nail guns is that the batteries are almost always ‘device-exclusive.’ This means if two batteries die (always have a backup) you can snag one from a cordless drill to finish the job. This is one major benefit of battery guns compared to gas. Another issue with the fuel nailers is that the gas often ‘freezes up’ in cold weather causing the gun to fail. All that being said, they are great devices for indoor trim use or as a secondary nailer to the traditional guns in your tool arsenal. If you’re going to fully understand all your options when it comes to nailers, you should probably know about the fourth type of power source which is called powder-actuated. These guns are used solely to fasten objects to hard substrates such as steel or concrete. The process of joining these materials works in a very similar manner to firing a handgun. The cartridges used in powder actuated tools are blank. A firing pin strikes the primer which lights a charge that builds up a pressure in the chamber. The pressure forces the nail into the concrete or steel for a very secure fit. You really need to evaluate what kind of jobs you’ll be performing when it comes time to select the right power source for your nail gun. Most general contractors will opt for the pneumatic guns because they use the nailers so frequently and often already have the air compressor out on most job sites anyways. Finish contractors that specialize in trim prefer the gas nail guns because they are mobile and the air compressor cords do not clog up their interior workspace. Handymen or specialty contractors such as siding installers may keep a battery powered nailer on hand because they only do framing sparingly. Another thing to consider is that if you are going to go with a pneumatic nailer, you may also need to purchase an air compressor if you don’t already have one. Most air compressors offer more than enough PSI to adequately drive fasteners even through some pretty hardwood. What you’ll want to focus on is tank size. Non-industrial air compressors usually range in tank sizes from 1 gallon to 6 gallons. The smaller the tank, the more frequent the cycle time. Therefore if you’re a hobbyist, a smaller compressor might suffice but if you do a lot of nailing then the larger tanks are better. One other feature to look for in an air compressor is decibels because if all things are equal – go for the quieter machine. Regardless of which nail gun you buy, you’re probably going to buy the fasteners specifically for it. Nail guns are designed to make the job go faster which is why they automatically feed the fasteners until the chute is out. Speaking of the chute, how the nails are correlated is another option at your disposal when selecting a new gun. Do you prefer coil nailers in which the fasteners are wound up in a circle or strip nailers where they are dispensed in a straight line? If you’re buying the fasteners specifically for the gun you purchase – does ‘how’ the nails sit in the gun even matter? The major advantage of coil nailers is that they hold more fasteners – of course, that also makes the gun much heavier. When you opt for a strip or stick, nailer you’ll have less firing capacity but the gun will be much easier to handle because it is lighter. Therefore when you’re deciding between a coil nailer and a stick nailer, it depends a lot on the type of gun you are going to be using. In roofing and siding nailers, for example, the fasteners are a bit smaller and more lightweight. In roofing nailers especially you’ll be firing off hundreds of nails in a day so the coil nailer is preferred. There are coil framing nailers, but you’re going to make one arm exceptionally huge because they are so heavy. Most contractors prefer the inconvenience of having to reload a strip framing nailer compared to the fatigue that lugging around a coil framing nailer all day would have. So far when it comes to picking out a nail gun you need to identify the type of tool you need, the power source, and whether it is coil or stick loading. The budget comes along with each of these features as the price varies when you go from type to power source, etc. Contact – nail guns have a trigger and a safety contact. The safety contact is in place so the nail gun fires into something and not just into the air like a regular weapon would. The contact firing method places a nail whenever the safety contact and trigger are depressed. This basically means you can hold the trigger, and a nail will fire every time the safety contact hits the wood, shingle, trim, etc. Single Actuation – very similar to the contact firing method except that the process of pulling the trigger and tripping the safety guard must be done for each fastener. To fire multiple nails, for example, the trigger must be released, the gun moved, the trigger pulled again, and the safety contact tripped. Full Sequential – both contact and single actuation guns will fire a fastener regardless of whether the safety trip or the trigger is pulled first, as long as they are both done. With a full sequential firing method, however, the safety tip must be pushed into the material and then the trigger pulled to release the fastener. Once the fastener leaves the chamber, that completes the full sequential cycle and the process must be completed again for each fastener. Single Sequential – just like the full sequential there must be in order to activate the single firing method. The major difference is that once the safety tip is triggered, firing additional nails only involves pulling the gun trigger. This means as long as you keep the safety tip pressed against a solid surface, the gun can be moved and fired with the pull of a trigger. These firing methods may sound complicated but they really do become second nature by about the sixth nail that you fire. Being able to adjust how deep a nail fires is important regardless of the type of job that the nailer is being used for. When roofing nails are fired to deep for example, the shingle will rip off the roof easier in high winds. If a siding nailer doesn’t fire deep enough, the head of the nail sticks out and can be a safety concern. A majority of nail guns allow you to adjust the depth by hand by turning a knob but some less efficient ones will require the use of a special tool. The nails in a nailer are held together by strips of coil. Sometimes these coil pieces get jammed in the gun or in the case of roofing nailers the tar from the shingles can cause clogging. Because of this, you want to be able to clear jams easily and efficiently. Quality nailers will have quick release levers that allow fast and safe removal of these jams. Other guns might require an Allen wrench or other tools to do the job so this feature could save a lot of time if you’re doing high volumes of nailing. Another very cost effective feature of nail guns is the ability to adjust to fit different lengths of nails. In some cases this feature saves you having to buy a separate nail gun altogether. Nail gun size adjustment ensures the best fastener is used for each job and it’s much more budget-friendly to buy new nails instead of a new gun. No matter what you’re nailing into, it’s hard to predict what you’re going to hit on the other side. When you strike metal-on-metal, for example, there’s not a lot of giving and protective guards will save you from a shard flying back into your face (always wear goggles too). Even when you’re nailing something seemingly easy like wood to wood, there’s a chance that the coil wire holding the fasteners together can discharge improperly so protective guards definitely never hurt. Pneumatic, gas, and even battery powered nailers give off heat and fumes as they are being operated. An adjustable exhaust can keep those fumes from flying back into your face which is especially helpful in confined spaces. The exhaust has an added benefit of cooling down the gun and being able where to point those fumes and heat can protect the device even more. It never hurts to offer as many extras as possible when a manufacturer is trying to entice you into the sale. This is especially true if the items are things that will extend the life of the product or if they are things you were going to buy anyways. Some examples include protective cases, hearing protection, safety glasses, etc. Besides saws, it could be argued that nail guns are the second biggest cause of workplace injuries in terms of tools. There are two main ways to avoid injuries when using your nail gun – 1) know the risks and 2) know your tool. Many times the two coincide. Nail gun injuries can be caused by a variety of ways. Risks increase when you bypass safety mechanisms, miss the workpiece, the gun double fires, the nail penetrates through the backside of the board, nail ricochets, and about a dozen other causes depending on your job and the material you’re fastening. Some of the risk factors are increased by irresponsible usage, but others are simply random occurrences like a gun jamming or a nail misfiring which is why proper safety equipment should always be worn. To avoid these injuries it’s important to know your gun. Get comfortable using it just like a police officer would take his weapon to the firing range. No matter what type of gun you go with, read the manual and make sure you’re comfortable using all the different features that your gun offers. If you’ve made the decision to purchase a nail gun, you’ve made a wise one. If you do frequent nailing, there’s no other way to achieve the safety and performance as if you’d use a gun. Even if you are more of just a hobbyist, using the nail gun sparingly is beneficial – plus with spare use, the devices will last literally 15 years or more. So what you need to look for when buying a nail gun is first off the type of nailer you need. This is one tool that is not ‘all-inclusive’ as say, a saw would be. Framing nailers generally can’t be used for roofing and you wouldn’t want to use a brad nailer for any type of framing. You need the proper nailer not only for performance but also safety and aesthetic reasons.